Finally, Joost team just gave me 3 invitations to send. I reserve 1 invitation for family and 2 invitations are to be sent to anyone who wants it. Please leave your first name, last name and email address in the comment below. Cheers and welcome to Joost TV. 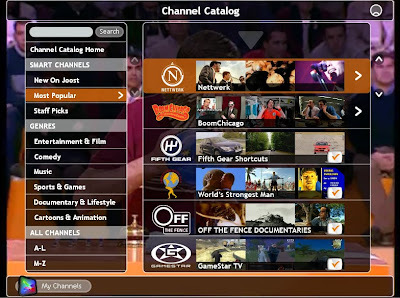 Joost is a streaming video application, and so uses a relatively high amount of bandwidth per hour. In 1 hour of viewing, 320 Mb will be downloaded and 105 Mb uploaded, which means that a 1 Gb cap will be exhausted in about 10 hours. If you pay for your bandwidth usage per megabyte or have your usage capped by your ISP, you should be careful to always exit the Joost program completely when you are finished watching it. To stop using bandwidth, you need to exit the program entirely as follows: Right-click on the Joost icon in the system tray (at the bottom right hand corner of your screen) and choose Exit. Sorry, this post is closed for comments. Please come to this one as I have more Joost invites for you. Thanks. Anymatters is now Joost official beta tester. Thanks Joost team! I just downloaded Joost but have no time to watch all channels on Joost. Hopefully this weekend, if I have time and bandwith. Briefly, it's the way to substitute the need of having a cable TV, by using an internet TV instead. No, it cannot be said as a substitution as this one is actually free of charge. Moreover, it's a community for particular audiences to a tailored TV programme that suits them. Or, I can say here, it's the way to utilise more of my internet time and connection. Of course, with additional cost of bandwith. Anyway, I'm not sure when I'm authorised to send an invitation. The way I can save my bandwith is by turning it off instead of pausing it whenever I don't wanna watch it. I think Joost broadcasts as a streaming audio/video file. 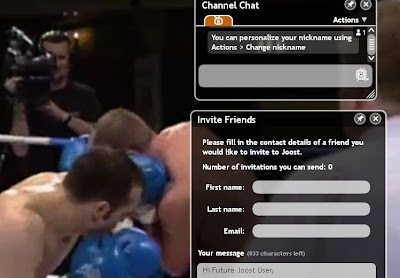 One emailed me to get an invitation, but true I still have 0 invitation to send as this screenshot below, taken when watching a boxing game. I at that time wanted to chat with someone talking about that programme. As kafe depok gives the signal, this is the visualisation. For visitors who don't get it, this is a brief description of a State Institute in Indonesia which provides an undergraduate study (even a Master study) in Public Administration for Local Government. Please imagine and tell me how strong Indonesia is. 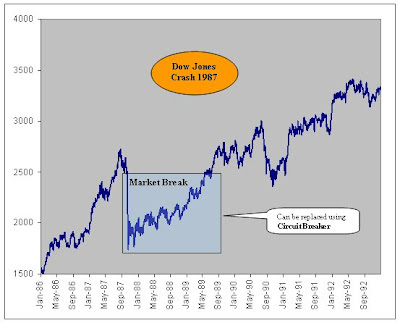 Some people may be worry with the possibility of crash in Dow Jones as blogged before "Dow Jones 1987 and 2007: crash then, crash now". It won't be happening now since NYSE has introduced a system called "Circuit Breaker". An imposed pause in trading that permits buyers and sellers time to assimilate incoming information and make investment choices. Circuit breakers promote investor confidence by giving investors time to make informed choices during periods of high market volatility. And there's a set of rules approved by the US Securities and Exchange Commision. The securities and futures markets have circuit breakers that provide for brief, coordinated, cross-market trading halts during a severe market decline as measured by a single day decrease in the Dow Jones Industrial Average (DJIA). There are three circuit breaker thresholds—10%, 20%, and 30%—set by the markets at point levels that are calculated at the beginning of each quarter. The formulas for these thresholds are set forth in the New York Stock Exchange (NYSE) Rule 80B. Meaning that the system will halt a few moments until the market neutralised as can be seen in this example. The halt for a 10% decline would be one hour if it occurred before 2 p.m., and for 30 minutes if it occurred between 2 and 2:30, but would not halt trading at all after 2:30. The halt for a 20% decline would be two hours if it occurred before 1 p.m., and between 1 p.m. and 2 p.m. for one hour, and close the market for the rest of the day after 2 p.m. If the market declined by 30%, at any time, trading would be halted for the remainder of the day. In response to the market breaks in October 1987 and October 1989 theNew York Stock Exchange instituted several circuit breakers to reducemarket volatility and promote investor confidence. The following isa list and brief description of these circuit breakers, and the currentlevels.